The Fourth Annual USA Games took place On July 1-6, 2018 in Seattle. More than 4,000 Special Olympics athletes and coaches from all 50 states and the District of Columbia, all in search of a gold. Team Iowa was among those and included: 10 Coaches, 29 Athletes, 4 Unified Partners, and 3 Athlete Leadership Experience members. There were 14 Olympic-type sports offered at the USA Games. Out of those 14, Team Iowa competed in: athletics (track and field), flag football, powerlifting, swimming, tennis, unified bocce, and unified bowling. Overall, Team Iowa had a final medal count of 27 gold, 20 silver, and 8 bronze. 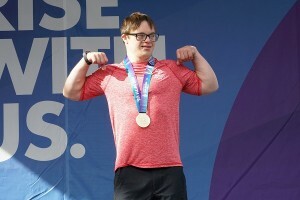 Among those medals included powerlifter Mitchell Betsworth (pictured above), who earned 3 Golds and 1 Silver. Mitchell says he, “loved competing and meeting all the athletes from around the country. It was great to make a lot of new friends not only from Iowa, but nationwide.” Mitchell’s father, Troy, who is also his coach made the trip to Seattle as well. “What I remember most about coaching Mitchell and Brad Small were the nerves. I was so nervous that I got down on one knee and thoguht I was giving Mitchell my last words of encouragement, and realized I was firing up a lifter from New Hampshire instead of my son!” “The coaches are constantly cheering for all of the lifters to do their best, so it was fitting” Betsworth commented. Making Team Iowa proud, Athlete Brandon Baier with the Griswold Tigers as the only athlete at the USA Games to qualify for both the High Performance 100 M Dash and the High Performance Shot put. While in Seattle, two Team Iowa members received recognition for being in the Top 10 in their category of the Steps Challenge (offered by the National office). There were 2,580 indviduals registered in the Challenge. Congrats to Brandon Baier, with the Griswold Tigers, for placing seventh. Another congrats to Ron Schmidt with Sioux City West Middle School for making the Unified Sports partner Top 10.